The advances in laser technology over the past two decades have been used to improve people’s lives in countless ways. For a myriad of medical and cosmetic conditions, laser treatment can dramatically transform your appearance. One laser system today delivers the fastest, safest, and most versatile treatments available – the Candela GentleMax Pro. The GentleMax Pro is actually an integration of two laser platforms featuring dual wavelengths, elevating the science of heat and light to a new level of cosmetic and medical laser treatment. The system takes the fastest, most powerful 755 nm Alexandrite laser and combines it with the incredible performance of the 1064 nm Nd:YAG laser to deliver an efficient, versatile, safe, and effective solution to your problems with a single beam of light. However, most dermatology patients in San Diego don’t find this uncomfortable because prior to and after each laser pulse, the top layer of your skin is cooled with a quick spray of cryogen to reduce any discomfort. Some patients even choose to have a topical numbing agent or another pain medication to further increase the comfort of this procedure. Hair removal is probably the most common laser treatment utilizing the GentleMax Pro, and with good reason. 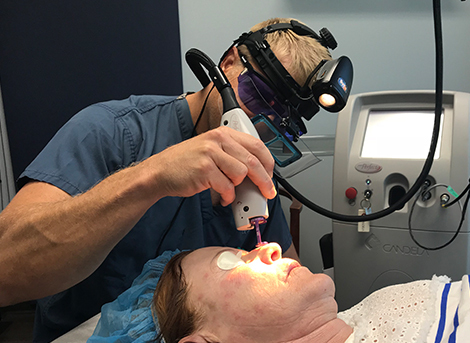 During the procedure, bursts of light energy are shot into the chosen area of your skin and, regardless of the size of the area you’re having treated, targets all hair follicles within that area for removal. The beams of light energy are intense, so as each hair is removed, you might feel mild pinching or stinging. Depending on the size of the area you want to be treated, this laser procedure can take anywhere from a few minutes to an hour, and you can have unwanted hair removed from any part of the body you choose. Common areas include lips, legs, cheeks, underarms, arms, and back. Many men choose to have laser treatment on their face or neck for bumps due to their beards. Additionally, GentleMax Pro is also effective for treatment of all skin types. Learn about the science behind laser hair removal at WebMD.com. The amount of GentleMax Pro treatments depends on a variety of factors. One major factor is the area of treatment you want. On some areas of your body, hair growth is thicker or denser than in other areas. Another factor is your body’s hair growth cycle. The hair needs to be targeted at the right phase of the hair growth cycle for the most effective results, which is why laser hair removal treatments can take up to 6 sessions. However, the end result is worth it in terms of money and time saved from not having to wax or shave. Other factors include your age, overall health, diet, metabolism, weight, hormonal activity, and more. If you’re considering treatment for something other than hair removal – such as for wrinkles, age spots, or spider veins – there are other factors that could come into play. Laser treatment with the GentleMax Pro is safe, effective, and fast. There are very few side effects, and the ones that do arise are mild and temporary. These include redness and/or swelling around the hair follicle site, but it normally doesn’t prevent you from resuming your normal schedule. Any redness or swelling that you do experience typically recedes within 24 hours. syneron-candela.com has more information on the safety of this laser treatment. All you’ll be left with is beautiful, smooth skin that positively glows! Due to the advanced, dual wavelength technology of the GentleMax Pro, you can have successful results regardless of your skin color. Treatment with inferior lasers or laser technology in the past was not always suitable for darker skin, but this cutting-edge dermatology technology treats all skin types and colors safely and effectively. In addition to Candela Gentlemax Pro, Cosmetic Laser Dermatology in San Diego offers the LightSheer DUET for effective laser hair removal. Contact us today to learn more about these hair removal treatment options!